When I read the invitation dated September 9, announcing that a high-ranking official was to make a speech on Russian-British relations at Lomonosov Moscow State University on 12 September, it was not hard to guess who the unnamed official was. British Prime Minister David Cameron lived up to the occasion. He made his speech at the university the highlight of his Moscow visit. In what was, in fact, an informal press conference, Mr. Cameron explained why he had come to Russia. In his opinion, Russia and Britain still regard their relationship as a zero-sum game – when one country strengthens its security the other feels less secure. Mr. Cameron believes that this approach is anachronistic i n the 21st century . But isn’t it rather late to be reaching this conclusion now? The British have long been watching America and then Europe reset its relations with Russia in all areas, from foreign policy to economics, but they have made no move in this direction themselves. Cameron wanted to know whether London would be able to make up for the losses due to the sharp cooling of relations between our countries over the Litvinenko murder, or whether relations with Moscow had reached a point of no return, with neither side able to forget its grievances or start negotiations from a clean slate. Cameron’s visit showed that both countries were unwilling to forgo their principles. The differences between Russia and Britain were not smoothed over but the negotiators had not set out to achieve this. David Cameron and President Dmitry Medvedev made it plain that they have very different views on the legal aspect of the Lugovoy case – the chief suspect in the Litvinenko murder. And they do not see eye to eye on the question of introducing sanctions against Syria. Even so, Medvedev and Cameron studiously avoided using the word “differences”, preferring to call them “difficult topics” when mentioning their diverging views. 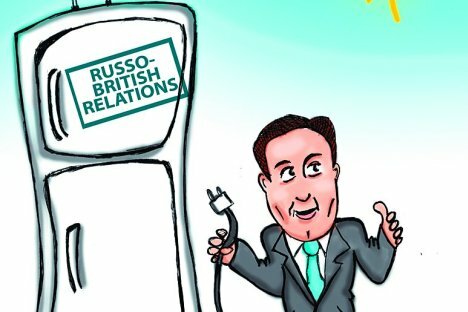 Clearly, it is too early to claim any reset of the relations between Russia and Britain. But the fact that Cameron arrived with a delegation of 20 top-ranking businessmen, which included BP’s chief executive Robert Dudley and Sir Simon Robertson, non-executive chairman of Rolls-Royce Group, which produces energy systems, gave a strong signal that he was serious about doing business. Many of the documents signed in Moscow were aimed at improving the business climate for trade and investment. The declaration on partnership based on knowledge for modernisation includes, among other things, support for freer movement of students and scientists, and interaction between the Skolkovo innovation centre and the planned technology hub East London Tech City. In his speech to the students, Cameron identified the areas in which Russia and Britain must co-operate. They are the creation of a good investment climate for business, science and innovation, and maintaining stability and world security. Memoranda on co-operation in creating an international financial centre in the Russian capital were signed. The state nuclear corporation Rosatom signed an agreement of understanding with the Rolls-Royce Group. Several new contracts were signed to the tune of £250m. All this gave Russian analysts strong grounds for claiming the visit had yielded many practical results as well as an impetus for increased co-operation. biggest investor in the Russian economy. In the first six months of this year alone, trade between the two countries amounted to $10.3b n (£6.6bn) . Russia has shipped to Britain $7.2bn worth of commodities and energy resources, receiving $3.1bn worth of machine tools, chemicals and consumer goods. Even so, does this provide a sufficient economic foundation for giving a fresh start to the relations between Moscow and London? In spite of the visibly friendly atmosphere that marked the visit, neither side was ready to make concessions, let alone unilateral ones. The British Prime Minister’s visit though, did manage to resuscitate Moscow-London relations from the prolonged coma they had been in. Russia has long been waiting for this step on Britain’s part. “Together we are stronger”, said Cameron, in his speech about Russian-British relations at Moscow University. But only time will tell if Britain will seek to reset relations with Russia without ultimatums or preconditions. Yevgeny Shestakov is editor of the international desk at the Rossiyskaya Gazeta.